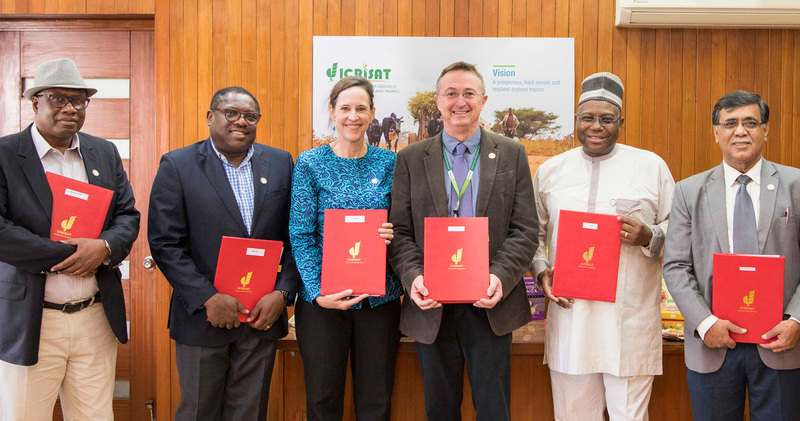 (L-R) Dr Abdulai Jalloh, CORAF; Mr William Asiko, FANRPAN; Ms Joanna Kane-Potaka, Assistant Director General-External Relations, ICRISAT, and Smart Food Executive Director; Dr Peter Carberry, Director General, ICRISAT, Dr Yemi Akinbamijo, FARA and Dr Ravi Khetarpal, Executive Secretary, APAARI at the signing of agreements on 13th January, 2019 at ICRISAT, India. Hyderabad, 18 Jan 2019: Leading agriculture organizations from Africa and Asia have joined hands to take on a bold initiative to create a big new industry, with the intent of bringing some Smart Foods back on the plate as major staples. Targeting staples lays the foundation to generate major impacts on health and the agri-food system. The inaugural meeting and signing of agreements by the largest agriculture associations in Africa and Asia took place on 13th January, 2019. This culminated in the formation of the Smart Food Executive Council led by – the Asia-Pacific Association of Agricultural Research Institutions (APAARI), Forum for Agricultural Research in Africa (FARA), West and Central African Council for Agricultural Research and Development (CORAF), Food Agriculture and Natural Resources Policy Analysis Network (FANRPAN), along with the International Crops Research Institute for the Semi-Arid Tropics (ICRISAT) which set in motion the Smart Food initiative in 2013. “I see how we can make Smart Food a household name. We need to link and synergize other existing programs along the whole value chain. Capacity building will be one opportunity especially in taking a holistic Smart Food approach where issues around nutrition/health, environment and farmer welfare can be tackled.” — Dr Ravi Khetarpal, Executive Secretary, APAARI. “We see history unfolding before us as this is how big things emerge. Smart Food resonates with the desire to see the power of science translate into reality. I am happy that Smart Food is now institutionalized. FARA is excited to cooperate in this partnership and hold this partnership responsible for the success.” — Dr Yemi Akinbamijo, Executive Director, FARA. “This approach is a fitting response to today’s major global issues. We want to add to the big crops; not displace them. Moving from the Big 3 staples (rice, wheat and maize) to having more, the Big 5 and later the Big 7, is an important aim. Now we have to go from a pitch to reality. Key to this are the nutrition and climate change adaptation needs and this is core to Smart Food. Smart Food crops have been neglected for reasons other than value as they are inherently nutritious and adaptable to diverse farming systems. We need to promote these inherent values.” — Dr Abdulai Jalloh, Director of Research and Innovation, CORAF. “Smart Food is a noble and novel idea and well thought through. The major staples did not get to where they are by accident. There are benefits and financial viability, but this viability varied for different value chain players. We need to learn from these successes and ensure financial sustainability. Engaging with large players is a part of making this come to reality to ensure benefits to smallholder farmers and the environment.” — Mr William Asiko, Board member, FANRPAN. “This new partnership strengthens collaborations between Asia and Africa and can open up opportunities to join forces at any point along the value chain, from consumers through to processors, chefs through to farmers, researchers and others.” — Dr Peter Carberry, Director General, ICRISAT.